The extent to which Jurassic World: Fallen Kingdom is better than or worse than 2015’s Jurassic World is mostly dependent on relativity. Or, to paraphrase from another review when this franchise was only three films old: they’re both miles from good, so there’s no real victory in figuring it out. That’s more scathing than either of the newer films deserve; the 2015 film wasn’t actively bad, just bland and overly fan-servile. This one starts out like a disaster, and halfway through it’s like the movie hits its head, forgets what it is, and gamely skips off into some weird hybrid genre of operatic horror, Victorian drama, and biotech thriller. In that order. It’s absolutely ludicrous and thoroughly stupid, but it’s not a showdown with raptors and a T-Rex on a tropical island; it’s at least different. Actually, let me lay out the movie’s two unambiguous positives right here. First, it looks just great—layered, textured, with the camera moving and framing like it’s telling a story and not just waiting for the effects to be added in later. It’s not as rich as the nighttime photography of 1997’s The Lost World, perhaps, but we’re about on par with Dean Cundey’s work in the first film, and we’re so far ahead of World and Jurassic Park III that we might as well be talking about a different franchise. The opening action scene is shot during a storm, at ground level, using lightning strikes and rain to selectively hide and show crucial information. In doing so, it actually sort of manages to make a tyrannosaur frightening again. That’s the second thing: I wouldn’t call Fallen Kingdom a scary movie, but it does possess at least a few moments and setpieces structured and paced like one (a close-quarters encounter with a carnivore in a darkened bunker, lit with streams of glowing lava, is a terrific manifestation of tension and close-quarters escape). That opening action scene, by the way, sets up a primary driver of the movie’s story: in the ruins of Jurassic World, the skeleton of the Indominus Rex—last seen being dragged into a body of water by a mosasaur—is being harvested by divers for an as-yet-unknown purpose (at least, unknown to anyone who hasn’t seen the movie’s trailer, which gleefully reveals the vast majority of the plot). Whatever the reason, time is a factor; Isla Nublar has a long-dormant volcano that’s started the process of erupting, and the whole world is watching with apprehension at what (if anything) will be done about the island’s genetic inhabitants. Presumably, the executives at the Masrani Corporation have a sense of closure knowing that, even if their park hadn’t been the site of a massacre, it’d be shut down shortly after by Mother Nature. Lobbying the U.S. government to save the dinosaurs is former park director Claire (Bryce Dallas Howard); lobbying to let them perish is human warning siren Ian Malcolm (Jeff Goldblum). In the middle of nowhere, building a house with lumber that looks freshly airlifted from the nearest Home Depot, is Owen (Chris Pratt). When the lobbying effort fails, Claire is recruited by Benjamin Lockwood (James Cromwell) and his aide Eli Mills (Rafe Spall) to evacuate the animals to a heretofore-unseen island sanctuary that we are promised will get it right, will allow them to live naturally. They have a particular interest in Blue, the velociraptor raised from birth to recognize empathy and listen to commands. Blue is too smart to be tracked, we’re told; why not just bring in Owen himself to recover her? If I am Claire in this moment, I wouldn’t be able to hear the rest of what they’re saying over the Greek chorus of warning bells and sirens going off in my head, but perhaps this is why I was never the director of a multibillion-dollar experiment in human folly. Thus does the movie kick off its plot with what for all intents and purposes looks like a warmed-over rehash of The Lost World, complete with flirtatious/antagonistic back-and-forths between Claire and Owen even more wan and limp than those between Jeff Goldblum and Julianne Moore. The stuff on the island doesn’t do a whole lot to reassure that kind of apprehension. Along with the two principal protagonists, there’s an IT guy and what Wikipedia assures me is a paleo-veterinarian (this introduces its own subset of confusing questions: what other specialized industries exist because of this park? Can a paleo-vet can also be certified as a regular vet in the event they don’t end up at the one place on earth where dinosaurs exist, or are they just out the tuition they spent on paleo-vet school? ), and what ensues is a low-energy pantomime of that 1997 film’s altercations between the environmentalists and the paramilitary, except this time we don’t have Pete Postlethwaite to class things up. Ted Levine takes his place as the head of the paramilitary squad; he’s a despicable character, but he lacks the same gravitas or intelligence. The squad is there to execute orders on behalf of Mills: recover the dinosaurs not for sanctuary, but for sale at private auction, and profit. It’s right around the moment where the volcano finally erupts in full, engulfing the island in ash and fire, that the movie begins to pick up a little. The pyrotechnics on display give us something to work with visually that we haven’t really seen from the series before; director J.A. Bayona and DP Oscar Faura start to get bolder with the images on screen. There’s a wide shot of a ship moving away from the enshrouded island that’s startling in its composition and use of light and shadow. And we’re given a moment that’s perhaps the most overtly elegiac of the entire series: our protagonists have escaped on that aforementioned ship, and they look back toward the seaport to see a lone brachiosaur, walking after them and calling as a volcanic cloud approaches the coast from behind it. The Jurassic series has never faltered when it comes to designing effective vocalizations for the island’s inhabitants, and the result here is uncharacteristically mournful because of it. The private auction is to take place at the Lockwood mansion, and forms the basis of a sustained hourlong setpiece—winding around the mansion’s different levels and sublevels and rooms—that I suspect was much of the reason Bayona was attracted to the project. The director previously made 2007’s The Orphanage, and more or less transplants the evocatively creepy energy from that film onto this one, grafting onto a biotech thriller the aesthetics of a haunted-house horror movie with an especially ornate house. It’s an intriguing mix on its own merits; it works here because the scenario relies mostly on effective camera movement, lighting, and use of color, and Bayona is really good with those things. At its peak moments—the fallout from the auction (which sees the unveiling and escape of a new and even more vicious genetic hybrid than the last one), a rooftop stalking sequence in the rain, and especially the entry of a carnivore into a child’s bedroom—there’s a kind of sublimely horrific beauty to what plays out. It looks nothing like what we’re accustomed to for a Jurassic film, but it makes for a great-looking survival horror. Does this redeem the first half, along with the inherent liabilities of the franchise (i.e. it’s pretty much a one-trick pony on its fifth go-round of the trick)? I want to say yes, because everything ups its game (even the Owen/Blue “connection” storyline gains a shade or two of nuance), because the movie tries something new and mostly pulls it off, and because the screenplay has more on its mind about the ethics of cloning, the manipulation of scientific progress for the sake of money, what constitutes a living animal vs a piece of private property, and especially the inability to close a Pandora’s Box once it’s been opened (whatever you think of the movie’s ending, it raises the stakes in a way I thoroughly appreciated). But an idiot plot and characters with ambitions for higher function is still idiotic, and Fallen Kingdom drops the ball in every relevant way besides the strength of its visuals. The humans, hero and villain alike, make it to two dimensions by the skin of their teeth, with no participant really registering as anything other than a plot point or as future dinosaur food. 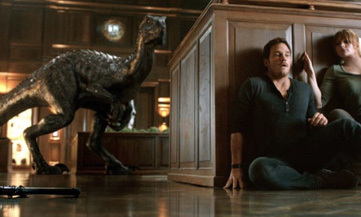 The sequences with the new hybrid (the Indoraptor, we’re told) are effective, but mostly because the design team bypasses subtlety altogether; they make the thing look straight-up evil, give it the personality of an obsessive psychopath, and toss it into a mansion made partly of shadows. And by the time the end credits arrive, we realize that the best parts of the film are not only mostly ephemeral, but relative in how good they really are: the best of their type in the series, perhaps, but in a series that has mostly flubs on its record and possesses a formula that already feels explored and re-explored in every nook and cranny of its being. The movie clears the low bar set for it, but that really only gets it to “less below-average than normal”.